This disc from NMC takes its title from the oldest known magnetic substance in the world: Magnetite. It is also the title of Emily Howard's orchestral work, and the disc presents a survey of her work from the small to the large scale, with orchestral works Magnetite and Solar, Mesmerism for piano and chamber orchestra, Afference for string quartet, Leviathan for baritone saxophone and percussion, and Threnos for soprano and bass voices. Performers include Lucy Goddard (mezzo-soprano), Simon Whiteley (bass), Joshua Hyde (baritone saxophone), Noam Bierstone (percussion), Elias String Quartet, Alexandra Dariescu (piano), and the Royal Liverpool Philharmonic Orchestra conducted by Andrew Gourlay. Emily Howard did a degree in mathematics and computer science, and this underlays her work. Most of the pieces on the disc have some sort of scientific or mathematical structure (or meta-structure). But frankly, despite a similar background (I too have a degree in mathematics and works in IT for 30 years), I find that I can rarely relate the scientific programme to the music, and that the pieces work best heard blind, so to speak. 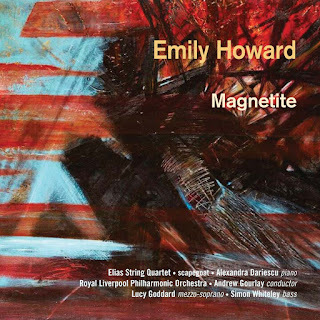 Magnetite is a large-scale work, starting with a big gesture but then exploring textures with spareness and subtlety, performed by the Royal Liverpool Philharmonic conducted by Andrew Gourlay. The work was Howard's first big orchestral commission, and premiered by the Royal Liverpool Philharmonic Orchestra in 2008. The work constructs a dramatic scenario from ideas of travelling through a magnetic field (or you can just sit back and enjoy the journey). Threnos uses two voices soprano (Lucy Goddard) and bass (Simon Wilding) to create a trio, with Wilding using falsetto too. It is wordless, austere and strange. But I felt it stretched the material too far, once you had got over the novelty of the bass singing above the soprano. Mesmerism for piano and chamber orchestra is performed by Alexandra Dariescu and the Royal Liverpool Philharmonic. And it is pure magic. A sort of concerto, it relies on seduction and mesmerism, rather than bravura display. The piano part is fascinating and full of delicate textures, heard in dialogue with the orchestra, and the dialogue gets pretty intense at times. The work was inspired by Ada Lovelace (the daughter of Byron), she dabbled in mesmerism and in fact Mesmer was a patron of Mozart's. Leviathan is hard work, combining baritone saxophone (Joshua Hyde) and percussion (Noam Bierstone playing mainly bowed cymbal), the result is a series of disjoint pitches and again the composer's fascination wiith a particular timbre gets the better of her. Ten minutes seemed too much to stretch a musico-scientific experiment. The work was written during Howard's Leverhulme Residency at the Department of Mathematical Sciences in Liverpool. Solaris for orchestra, again performed by Gourlay and the RLPO, starts with a big sound and then exploits extremes, with either spare or full textures, sustained elements and moments of sharp drama. Created out of a musical image of the sun as a life force, the work was commissioned by the London Symphony Orchestra as part of UBS Soundscapes: Pioneers and first performed by them in 2010. The final work on the disc is Afference, a twenty minute work for string quartet played by the Elias String Quartet. The title, Afference, is a physiological term describing how the brain receives signals from the body. The work is in two movements, but plays continuously. Again, Howard's construction is full of remarkable detail which links the music to the science. The opening is very intense and very dense, but though the textures thin out we are aware of repeated stabbing gestures. Sectional in construction, there is a feeling of exploring different textures rather than a sense of dialogue between the four instruments. Despite some lighter, scherzo-like moments, the work is consistently intense with a sense of pushing the instruments to extremes. Afference was first performed by the Elias String Quartet at the Wigmore Hall in May 2015. The music on the disc is all challenging stuff and performances are all excellent, giving you a real opportunity to hear a wide range of Howard's instrumental music, in both large-scale and small-scale forms. There are times when the music on this disc seems more like a sustained experiment rather than a whole work, that Howard seems more interested in exploring a particular texture or structure, rather than emotional engagement. Yet at their best, the three large scale orchestral works and the string quartet show a very distinct voice, one which takes the fascination with scientific theory and fashions and emotional journey.